Eleaf have been a staple manufacturer in the Vaping game for some time, offering a range of tanks and mods. These have been primarily aimed at the budget friendly market, but have also proved to be good performing equipment. The Eleaf Pico was a popular release for the company as it appealed to many people and became a well known mod. 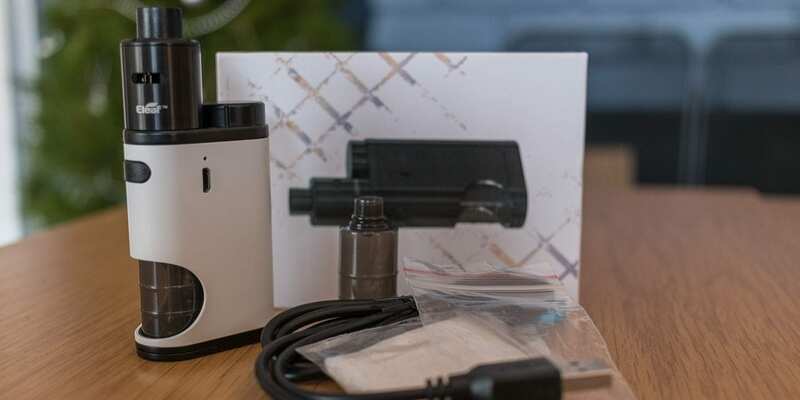 The 75W Pico was an attractive choice for vapers because of it’s price, small size, single 18650 operation, temperature control options and good solid performance. Eleaf have now released the Pico Squeeze. In keeping with the same form factor as the original Pico, the Squeeze is also operated from a single 18650 high drain battery. The main feature this new mod is that it incorporates a squonk mechanism right into the mod. 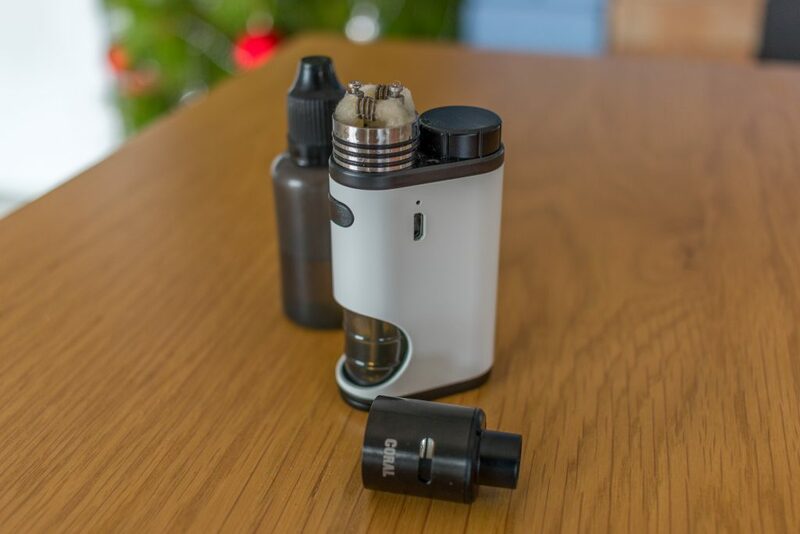 For those that aren’t familiar with squonking, it is a colloquial term given to the setup of having an inbuilt bottle of juice beneath an RDA. The juice is pushed up to the RDA, which is called a bottom fed RDA, through the 510 pin via a tube from the bottle. So by pushing on the juice bottle, via a small cut out section of the mod, juice flows up into the RDA and saturates the wick eliminating the need to manually drip. This is a very popular style of vaping by many people as it gives the flavor and vapor production of an RDA without having the hassle of having to drip all the time or carrying a juice bottle around with them. Just a quick squeeze and you are good to go until your wicks run dry. Before we go any further I’d like to thank GearBest for sending me the Pico Squeeze for review in this article. The Pico Squeeze is available as a stand alone mod or as a kit with the Coral BF RDA. I received the whole kit, so that is what we will be covering here. 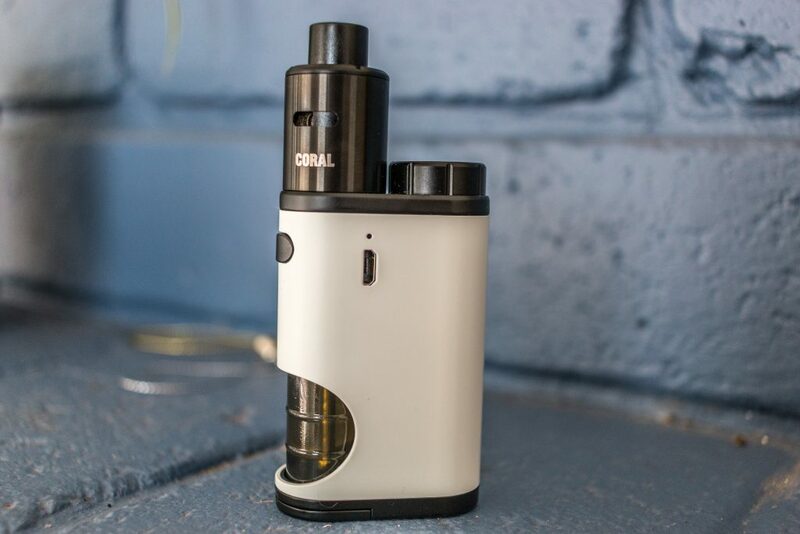 Check out the Eleaf Pico Squeeze Kit Here! Click Here to Check out the Eleaf Pico Squeeze Kit! The packaging is very much in line with the rest of the Eleaf product range. A predominantly white box with some grid like colors and a product picture. The mod sits up top with the accessories sitting below the padded cradle. The mod is presented with the Coral RDA already attached to it. Picking it up, my first impression was that it was all very light and it fit into the palm of my hand. This thing looks very stealthy and appears that it won’t weigh down in my pocket. Put together as a kit, the whole setup looks really good, nice and compact. The mod seems like it’s fairly sturdy, well built and it doesn’t rattle at all – so there is no loose bits or buttons in there. The cutout that you squeeze the juice bottle with, is perfectly placed on the mod enabling you to use it with your bottom fingers while not having to take your top finger off the fire button. The mod fits in your hand perfectly and seems to be the right size for a comfy grip. There is one LED status light on the side of the mod and this is supposed to give you all the feedback required to operate this mod. The battery is inserted from the top and has removable door that screws off from the top of the mod. The squonk bottle is accessed by removing an access door which is held to the mod via magnets. The fire button is clicky enough, not the clickiest button I’ve ever seen, but also not the worst. The micro USB charge port can be found, vertically positioned, just below the LED light. That’s it, no adjustment buttons, no dials, no screen, no gimmicks – simple. The Coral is a two pin, bottom fed RDA with adjustable side airflow slots. It feels very lightweight and not very sturdy. The base appears to be made from stainless steel, while the top cap/chamber section is very flimsy and seems to be either soft delrin or some similar type of material. The base can be completely removed from the chamber to give extra room when installing your build. The chamber and top cap are also separate, which means it breaks down to only 3 pieces for cleaning. The airflow can be adjusted from fully open to fully closed, and anywhere in between, by simply rotating the top. Building with the included coils is super easy, as they are already bent into the right shape to fit the posts. Use the included screw driver to loosen off the philips head post screws. Insert the coils on each side of the deck, making sure they are in line and do not protrude over the edge of the deck. Trim off the excess wire and dry fire the coils and make any final adjustments needed. Wick as you would any normal RDA and it’s a good idea to saturate the wicks before use. Inserting the battery, which does not come included with the mod or kit, is fairly straight forward. Simply screw off the top battery cap and insert your 18650. There are clear markings on the mod showing which way orient the battery. Do not stress if you do happen to install it the wrong way around as the mod has a built in reverse polarity protection system. Filling the squonk bottle is also very straight forward. Pull off the door housing the bottle on the bottom of the mod, it’s held in by a magnet and comes off very easily – make sure not to loose it. Pull out the bottle by gripping it through the exposed part of the mod and then turning once it’s down a little. Fill the bottle with your desired e-liquid of choice, it holds 6.5ml, and then repeat the process in reverse to put it back in place. Five clicks on the fire button and we are ready to vape. Make sure to have squonked some juice into the RDA and that your wicks are nicely saturated with juice. With practice, you will get to know how long and hard to squeeze for, until your wick has the right amount of juice on it. The LED light will provide feedback on your battery capacity. At 60%-100% the LED stays illuminated, 30%-59% the LED will blink slowly, 10%-29% it blinks at a moderate pace and below 10% it blinks rapidly to remind you that you need to change the battery or charge it. You will also notice the power of the mod running down as your battery does. The Pico Squeeze has a maximum output of 50W and operates much the same way as a mechanical mod does. This means that the final power you will get at the atomizer, depends on how much capacity is left in your battery and the resistance of your coils. With the Clapton coils included with the kit, the build came in at 0.26 ohms. Although the adjustable airflow and cloud production was impressive, there was a distinct lack of one thing – flavor. I found the Coral to be very muted in the flavor production department. It blows some huge clouds with very minimal effort, but it just doesn’t back that up with flavor. I really wanted this thing to kick out some flavor so I tried numerous other builds and wicking methods in the Coral, however nothing I threw at it made a difference. Every build was muted which was very disappointing for me. I tried a couple of my other BF RDA’s on the Pico Squeeze and it performed very well. I find that it hits just as hard as any other mechanical squonker and the battery life is also on par. This is a really solid squonk mod for it’s price point, I would recommend to ditch the Coral and utilize a better 22mm BF RDA. Once you have paired it up with higher performing RDA, you will reap the benefits. I really see this mod as a wonderful intro into squonking for the vaper who wants to start getting into this style of vaping. It’s a very accessible mod, that is comfortable, portable and very easy to use. I just wish that Eleaf didn’t spoil it by pairing it with such a poor quality RDA. For the price, you can’t go wrong with the Pico Squeeze. Just ensure you have enough in your vape budget to also cover a decent BF RDA to garner the full experience of what this mod has to offer. Feel free let us know your thoughts in the comments below and I hope you have enjoyed this article.